58/196 Max Braden This is a decent followup but I wanted more penguins. If you saw Madagascar and came away from the experience mildly disappointed, you're not the only one. It was a nifty looking movie that just didn't do it when it came to the story. The big problem is that the penguins, easily the most interesting and entertaining characters, simply didn't have enough screen time. Of course, since then, penguins have more than gotten their due, with the birds of Happy Feet and Surf's Up covering that territory adequately (both films are far better than Madagascar to be sure). Regardless, if you have a film that debuts to $47 million in its first three days and makes $193 million domestically on a $75 million budget, you're probably going to think a sequel is a good idea. And so it is that the good people at DreamWorks Animation have created a second go-round with the creatures of Madagascar, and they promise it will have a better story this time. 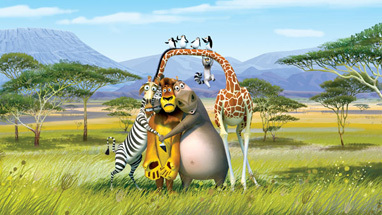 See the latest developments for this project on the Madagascar: Escape 2 Africa Movie News page.